If there is one word to describe my experiences in Myanmar, it would be shwe. It means ‘golden’ in the Burmese language, and from the moment of arrival, it epitomizes everything one sees in this enchanting country. This word is frequently used in the names of many important pagodas, accurately describing the sheer radiance of colossal temples literally covered in gold. Our first visit of the trip was to the Shwedagon Pagoda in Yangon. 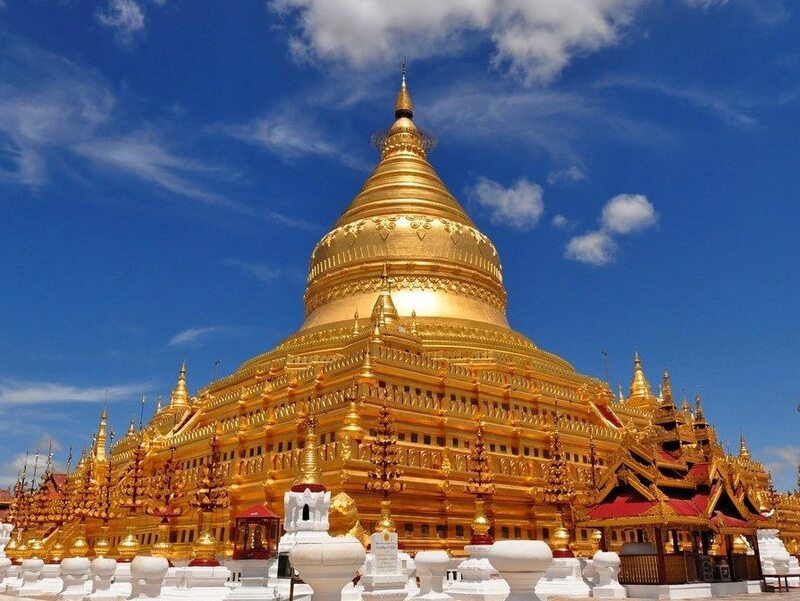 Not only is it one of the most important religious and sacred places in all of Myanmar, but it is also quite a sight to behold, with the main pagoda standing 110 meters high, gold from top to bottom! It is a spellbinding sensation to stand at the base of this monument, with the chimes and chanting of prayers reverberating in the background. Another highlight of the trip, a particularly golden sunset witnessed atop Shwesandaw Pagoda in Bagan, will not be easily forgotten. The Bagan Archaeological Zone is about the size of the island of Manhattan with over 2,200 pagodas still standing. Perched atop Shwesandaw one can only see a small fraction of them, but it is nonetheless breathtaking to watch the last rays of sunlight retreating towards the horizon, leaving the stupas glittering like jewels below. But for me, the most significant representation of shwe can be found by encountering the diverse people of Myanmar, who appear infused with the spirit of this word. With renewed excitement about their future and a recently-formed democracy, they approach life and visitors alike with an amazing sense of humor, compassion and joy… and, to be sure, with a golden smile. Join Far Horizons on an unforgettable, 15-day journey: Myanmar: Land of Golden Pagodas.